A once-stalled historic rehab in Church Hill is nearing the finish line, marking an end to a years-long effort by local couple John and Benedicte Whitworth. 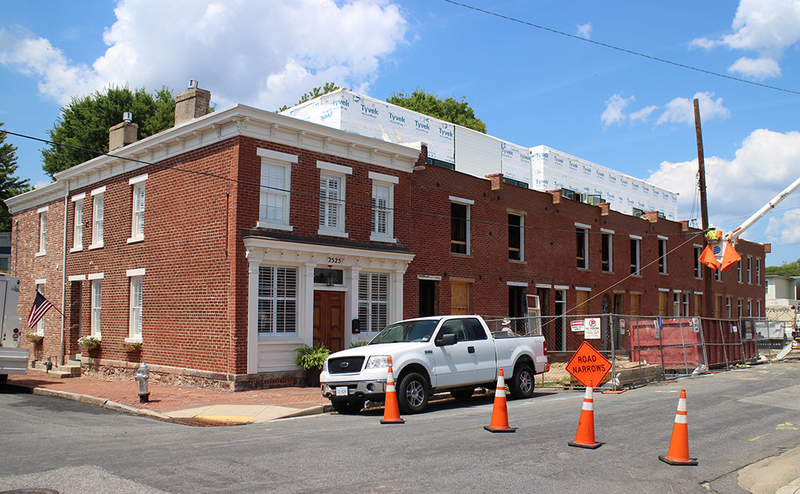 Construction is on track to wrap up by October on the block of 19th-century rowhouses along O Street between 25th and 26th streets. Work resumed in November to restore and enlarge the homes from their original 650-square-foot footprints to 2,000-square-foot units that mix old and new elements. 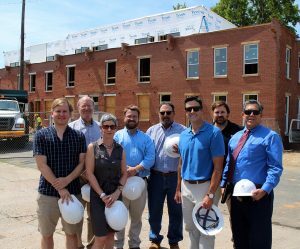 After a falling out with their original developer, the Whitworths took on that role last year and assembled a team that includes UrbanCore Construction, Architecture AF, Village Bank and One South Realty Group. The group’s effort, which began in March, has taken shape in the enlarged seven units and a new eighth unit on the western end of the block. An old corner store space at the corner of O and 26th streets was converted into a 2,400-square-foot residence that remains occupied. One of the former rear walls that’s been reassembled as an interior wall. The rear walls of the homes were taken down and reassembled as interior walls that provide a sort of gateway between the original, two-story floor plans and the expanded rear additions and additional third floor, set back 13 feet from the original brick façade to minimize their view from the street, said Architecture AF’s Forrest Frazier. John Whitworth noted interior walls were demolished due to safety concerns and fire code compliance. He said they made the decision after a determination by local structural engineer Charlie Fields. The second and third floors are filled with light from skylights and multiple windows. 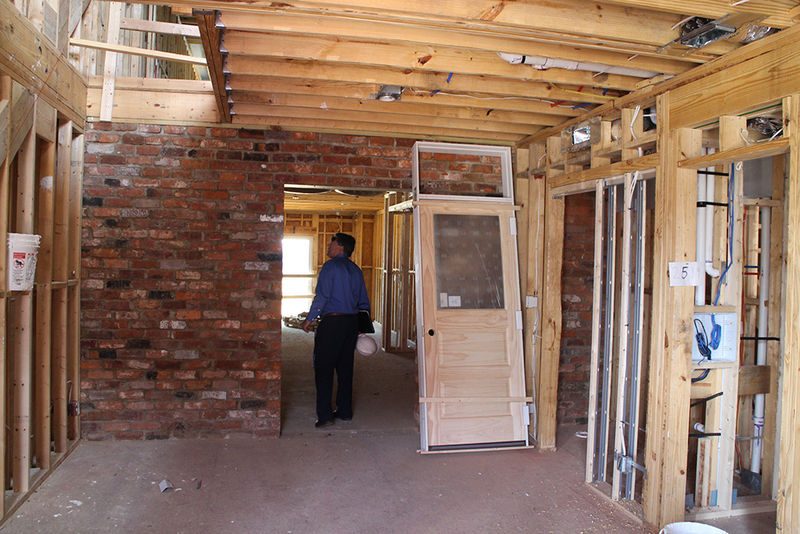 Frazier said the floor plans include bonus rooms for additional space and various uses. The original homes were built by English immigrant James Netherwood, whose work with granite in the 19th century can be seen in Richmond landmarks like the Robert E. Lee monument on Monument Avenue, the Confederate Soldiers and Sailors monument at the top of Libby Hill and the Old City Hall building – the largest granite building in Richmond. Whitworth said the exterior facades are being returned to their original 1874 appearance. 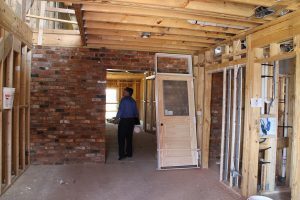 Front porches that were removed will be rebuilt with copper roofs, and a 60-foot tunnel passageway in the middle of the block remains visible from the front but was mostly filled in to provide closets and other space for adjacent units. Each of the middle seven units total three bedrooms and 3½ bathrooms and range from 2,000 to 2,200 square feet, while the new-construction end-unit totals 2,400 square feet with four bedrooms and 4½ baths. Each unit includes a rear rooftop balcony. One South’s Andrea Levine started marketing the units for sale in early May, with prices ranging from the mid-$300,000s to just over $400,000 for the larger unit. The seven restored units come with tax abatements of about $4,000 per year for about 10 years. Project team members in front of the O Street rehab, from left: Forrest Frazier, John Whitworth, Andrea Levine, Derek Meyer, Bob McClendon, Jeff Bunch, Matt Waring and Ted Balsamo. Rounding out the development team with UrbanCore were co-owner Jeff Bunch, project manager Derek Meyer, site superintendent Bob McClendon and assistant site superintendent Matt Waring. Having renovated homes in their native United Kingdom and with O Street their third rehab project in Church Hill, Whitworth said this will be the last for him and Benedicte, save for a neighboring building at 821 N. 25th St. that they plan to redevelop as residential or retail space. Having purchased the properties in 2014, Whitworth said: “It certainly has been a long journey, but for the last 12 months, it’s been quite an enjoyable journey, which we really appreciated. “This is going to be our swan song for Church Hill,” he said. 2 Comments on "Rowhouse rehab taking shape along O Street"
$400K for O Street?? Really? Yes, their list prices are pretty normal at this point.